Home › Knowledge Hub › Thought pieces › Who remembers 2012? 2012, it was the one after 11 and before 13. Yeh, that's the one. After extensive research I've been assured that I'm just about still allowed to talk about last year. Move on, Rob! Get over it. 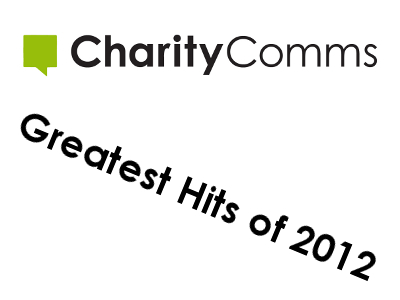 What and forget about all the fantastic content that's been shared on CharityComms.org.uk? That's a good point, please continue. It was a big year for us here at CharityComms with a brand refresh, a new website, loads of inspiring events, we turned five years old and of course I started! I'd like to share with you fine folk 2012's most popular articles and resources from our lovely, shiny website. 1. In at one is October’s Branding Inside Out Best Practice Guide. You’ll be delighted to hear it's still available if you want a copy. 2. Just missing out on top spot is our first Best Practice Guide to Portraying Beneficiaries and Service Users. 3. Despite being launched in November 2011 our Guide to Social Media still proved to be a very popular resource last year. 4. What five things should charities be saying on social media? Matt Collins told us. 5. The results of our favourite charity brand poll. 6. We asked a selection of our mentors for the best piece of career advice they’d received. 7. Trina Wallace’s top story telling tips. 8. Five top tips for an effective email marketing campaign from Katharine Earley. 9. Charlie Hulme discussed how to make your story stand out. 10. How to create and manage a case study library from Lisa Pettifer.